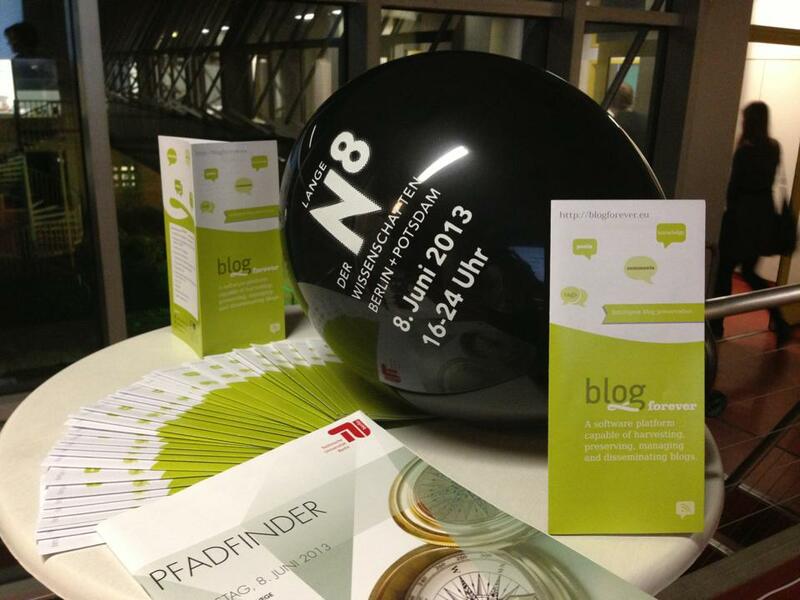 On Saturday, June 9, BlogForever was once again present to its appointment with Science, participating for the second year in the Long Night of Science in Berlin. The Long Night of Science is an annual event in Berlin and other German cities where large scientific institutions demonstrate their research topics and accomplishments to the public. 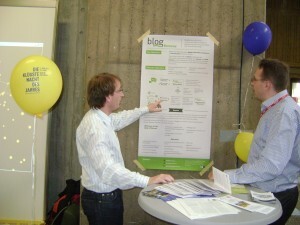 TUB was there presenting the project to the visitors and giving answers about the objectives and the importance of blog preservation. Students, as well as other non-academic visitors, were particularly interested in what BlogForever is about. Where can one personally meet bloggers from 50 countries and discuss the urgent issues of digital society in Europe? Right in the heart of Berlin, Germany. This year, BlogForever once again presented our consortium’s efforts at re:publica, Germany´s biggest conference for social media issues and innovation (http://www.re-publica.de/). The conference took place for the seventh year in Berlin with about 5.000 visitors. 450 speakers presented workshops, discussions and talks from the 6th to the 8th of May about the latest developments in social media all over the world. In such an environment of active bloggers and fresh ideas, it was a great pleasure to be included and have the chance to discuss our project with the people whose content we hope to preserve. It was both interesting and promising to see that the content of those discussions had changed from the previous year at re:publica. Many of our booth visitors were already informed and convinced that weblogs should be acknowledged as an important piece of our cultural heritage. Additionally, they were supportive of a more robust preservation, one that can better accommodate future research and improve accessibility for the public. The current situation in Syria and other crisis regions in Northern African countries were especially noted as underlining the necessity and importance of independent blogging and the access of such information for journalists, researchers and the public in general. While bloggers wanted to inform themselves about ways to preserve their own blog more completely and securely, they also asked for ways to disseminate their blog more efficiently. Some individuals indicated interest in a large-scale solution, similar to the internet archive (http://archive.org) in the United States, for European weblogs. BlogForever also met with researchers at several European universities who represented communities of expert bloggers focusing on specific thematic areas, such as science or technology. Several of these individuals expressed the need for a blog preservation solution which could strengthen research networks. We have come a long way in spreading the message about the importance of digital preservation, in particular of weblogs. The public is now ready to dream about the ways in which preservation can be valuable in the present as well as the future. The BlogForever project will be present on the CeBIT exhibition in Hannover/Germany from 05 to 09 March 2013.
the world’s largest trade fair showcasing digital IT and telecommunications solutions for home and work environments. The key target groups are users from industry, the wholesale/retail sector, skilled trades, banks, the services sector, government agencies, science and all users passionate about technology. CeBIT offers an international platform for comparing notes on current industry trends, networking, and product presentations. The BlogForever project will participate as part of the TU Berlin pavillion. You can find us in Hall 9, Stand C20. Last saturday, BlogForever was present at the Long Night of Science in Berlin and explained the necessity and challenges of blog preservation as well as the objectives and the status of the project to the general public. A lot of people were interested in the project and have not realized before that information could get lost in the internet. We shared our booth with the EU project Cyberemotions that examines and visualizes sentiments in e-communities. 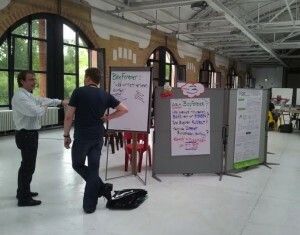 BlogForever hosted a small session yesterday afternoon at re:publica, Germany’s largest blogging and social media conference with more than 4,000 visitors from over 30 countries (http://re-publica.de/12/). Our session was related to the urgency of blog preservation and other relevant themes in digital archiving. As we get closer and closer to our final software, we keep in mind the purpose of taking on such a task: to prevent the loss of social, cultural and historical artifacts contained within the Blogosphere and to preserve them for future generations. We asked our visitors, what if Anne Frank’s diary had been a blog? What if Leonardo Da Vinci had kept his notes and sketches in blog format? What if Martin Luther had presented his critiques of the church on his blog instead of nailing them to the church doors? Understanding that it is difficult to know what should be preserved, or what will be important for the future, the time is still now to think of solutions and implement them – if we want to to avoid losses. We have enough examples of how failure to act has cost us valuable insights into our past and even our current understanding of the world. During our session, we heard several stories about “lost blogs”, blogs that are no longer accessible because their authors have passed away, or have moved on from the blogging community. Some blogs were removed because the authors no longer had the rights to the content (as with some government or business blogs upon staff changes). We also shared some examples of blogs that simply disappeared under somewhat dubious circumstances involving third parties (see one example here: http://techcrunch.com/2011/08/23/fukushima-robot-operators-blog-deleted-internet-steps-in/). Our discussion of digital loss was not limited to blogs, but also included some of the early online communities that wound up scattered into the digital wind due to reductions in software support or format changes (see the closing of GeoCities in 2009 http://techcrunch.com/2009/04/23/yahoo-quietly-pulls-the-plug-on-geocities/). All of these stories remind us that our digital heritage, both on a personal or cultural level, is every bit as valuable as the many collections of letters, diaries, first editions, newspapers and other artifacts we preserve in physical form. Blogs, as one of the more complex and multifaceted forms of digital media, require quite a bit more attention to ensure their authentic and robust preservation. To preserve blogs, one needs a software solution that will be able to respond quickly to dynamic shifts in world politics, science and culture – a solution that will allow us to develop blog archives that are valuable now. The solution must also be able to manage the development of technology and software redundancies – a solution that will ensure the safe preservation of digital artifacts well into the future. Curators, as well, will need certain tools and policy guidelines to help them manage the specific challenges associated with blog preservation. We presented BlogForever as the software solution that will meet all of those criteria and do so in a way that is efficient, effective and user friendly. Those individuals that we spoke with are excited about the project and see its value, not only for digital libraries and academic institutions but also for the general public.